The Carnegie Mellon University chapter of AIAS (American Institute of Architecture Students) is proud to announce the launch of its first ever AIAS Student Design Award. The award is geared towards fueling design out of studio. 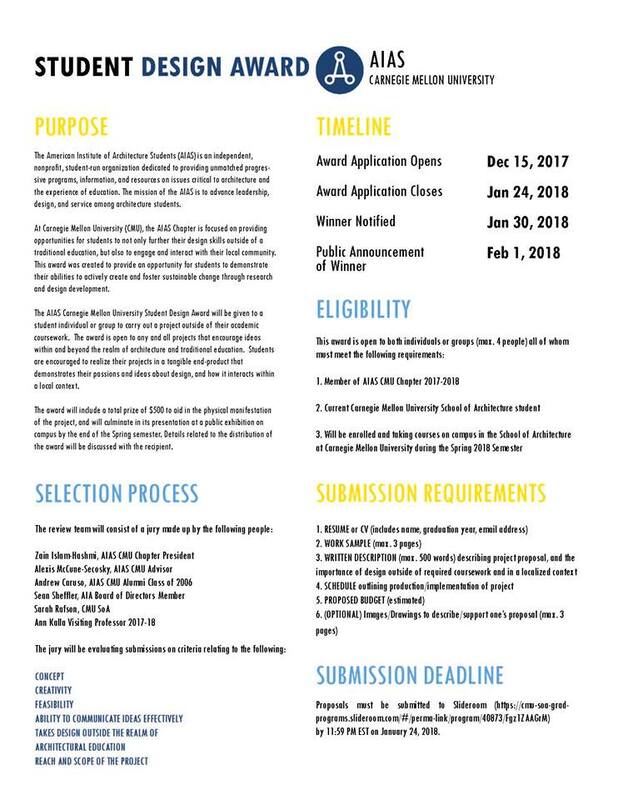 Open to any AIAS member currently enrolled at the SoA, the award encourages a student/group to pursue their passions beyond the realm of architecture and traditional education and to start manifesting their ideas through tangible end-products that start to interact with one's local context. Applications close 24 January 2018 at 11:59pm EST. Submit your entry on the submission site. For any questions or concerns, please email aiascmu@gmail.com.